When it comes to skincare, I have to confess: I’m not very dedicated. I’m a bit of a bog standard cleanse and moisturise kind of girl. I tone occasionally and will do the odd exfoliating mask, but anything else is usually new territory to me. 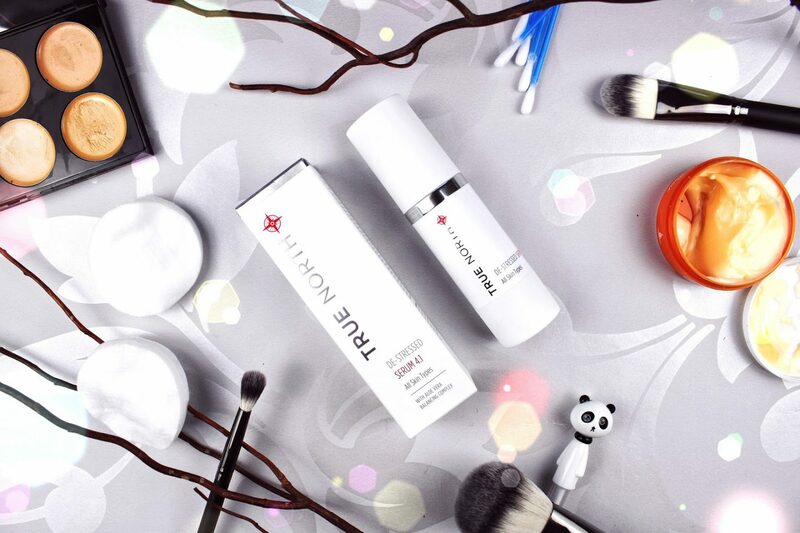 True North De-Stressed Serum* is a lightweight moisturising gel-serum that is said to infuse the skin with deep hydration whilst soothing and regenerating. It comes in simple white packaging that immediately gives the product a sleek, high-end feel to it. It comes in a pump action bottle which is always a positive – easy to use, controls how much you dispense, and is hygienic too! I’m rubbish at describing smells, but this smells beautiful. Seriously, the smell won me over as soon as I used it for the first time. It’s a lovely, clean, fresh scent. After applying the serum, it did feel a tad tacky on my skin for about a minute of so, but once soaked in, my skin felt amazing. It was instantly smoothed and my colour appeared more even. The instructions say to use the True North De-Stressed Serum* prior to moisturising, but I’ve been using it occasionally before makeup as a primer as well for a smooth base. What skincare products have you been using lately? Do you always stick to your skincare routine? Next Post Ashton, where are you?